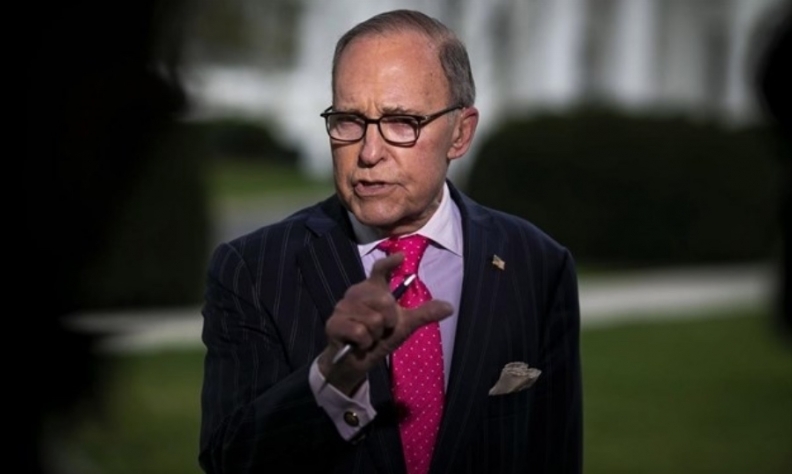 Larry Kudlow told a news conference Wednesday in Washington, adding that he's confident that the current angst over Trump's steel and aluminum tariffs will soon blow over. QUEBEC — U.S. senior economic adviser Larry Kudlow is calling his country's trade dispute with Canada little more than a "family quarrel" as media reports circulate of a tense phone exchange last month between U.S. President Donald Trump and Prime Minister Justin Trudeau. Similar disputes occur between countries all the time, Kudlow told a news conference Wednesday in Washington, adding that he's confident that the current angst over Trump's steel and aluminum tariffs will soon blow over. "I regard this as much like a family quarrel," Kudlow said. "I'm always the optimist, I believe it can be worked out, and I'm always hopeful on that point." Good luck, suggested Kudlow, the director of the U.S. National Economic Council. Regardless of what the rest of the world might think, Trump is deadly serious about reforming a global trade system he believes is fundamentally broken, he said. And tariffs are simply one more tool in the president's toolbox when it comes to repairing it. "The president was very clear with respect to his trade reform efforts that we will do what is necessary to protect the United States, its businesses and its workforce," Kudlow said. "We may have tactical disagreements, but he has always said — and I agree — tariffs are a tool in that effort. People should realize how serious he is in that respect." Kudlow also pointedly denied a media report suggesting U.S. Treasury Secretary Steve Mnuchin tried to talk the president into extending an exemption for Canada from the steel tariffs, calling it "patently false." He also refused to discuss what media reports are describing as a tense phone call recently between Trump and Trudeau. Officials in the Prime Minister's Office would not provide details, other than to say it took place on May 25 — the day Trudeau has said he initially proposed a face-to-face meeting with Trump to try to finalize a new North American Free Trade Agreement. That plan fell through when the White House tried to insist that he agree to including a so-called "sunset clause" in the deal. Trump has since mused about replacing NAFTA with bilateral trade deals with Canada and Mexico — an idea Trudeau said Wednesday is not on. "We have on various occasions heard the president speak about his interest or his musings about bilateral deals, instead of the trilateral NAFTA that we have," he said. "Canada's position is and always has been that the trilateral approach is actually better for Canada, Mexico and the United States. We think that demonstrating the strength of NAFTA as a solid community as we take on the world is very much in all three of our advantages, and we're going to continue to negotiate that way."